Whether you're working on following the Barnes & Noble 50 Books to Read Before You Die bookmark or Amazon's 100 Books to Read in a Lifetime, we all have our quirky lists of books that you feel you should read even though they were published before were born or something. At least this is generally true among bibliophiles. 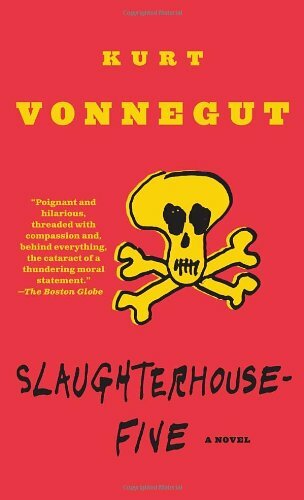 Slaughterhouse Five is one of the books that has been on my personal to-read list for some time now. A lot of folks keep referencing or mentioning this book for one reason or another and my curiosity has grown over the years. But of course with so many books in my general reading queue (particularly thanks to the likes of Angry Robot Books and NetGalley), it took me a fair amount of time before I finally diverted back to this particular. I have to admit that I had no idea what to expect when I came around to reading this book. And given that the only other Vonnegut book that I had read prior to this one was the more recent Hocus Pocus, I really didn't have much to go on. Synopsis: Slaughterhouse Five is a often tagged as a satirical novel or perhaps a science fiction novel as written by Kurt Vonnegut. The book has a lot of praise, but also has been banned a number of time given its content. At the center of this story is one Billy Pilgrim, a man who once fought in World War II and grew up to become an optometrist. But what's unique about Billy is the fact that he has somehow become unstuck in time. Thus he jumps back and forth throughout his life, and this is a timeline that includes a time when he is kidnapped by aliens from Tralfamadore. Thus we jump along his timeline and learn more and more about Billy and the events that he had experienced here and there. The whole story is told from the perspective of...someone. The voice claims to be someone who was there with Billy during the events in the war, but then he also knows of events that happened after the war. He also knows of Billy's full story in Tralfamadore, even though we never go through any sort of scene or flashback where Billy tells his crazy story to someone. The central event in the book is the bombing of Dresden, a series of raids between February 13-15, 1945 where bombers from the RAF and the USAAF laid waste to the city in order to cripple it as a means of transport for the Germans. But there were a high number of civilian casualties and thus it's argued that the bombing itself was unwarranted. The novel sort of dances around this event as multiple references are made until we finally get to "see" what happened for ourselves much later in the novel. Beyond the time-jumping science fiction premise, the story of this novel is actually a somewhat somber one that is truly satirical and not plainly comedic. The book does deal with stories of the war after all, and there's no way to dress that up in any manner. The repeated element of the narrator saying "So it goes" whenever death is discussed is an odd one. It's there to sort of soften the blow of all the deaths that Billy has witnessed, but there's no dressing that up in any true fashion, I suppose. The book may seem a little confusing at first given the non-linear flow of events. At the very least all stories that take place during the way follow one another more or less chronologically leading up to the actual bombing of Dresden. Everything else is sort of fair game for mixing up and even I had a bit of a struggle putting things together right away. It doesn't help that I'm instinctively trying to read into why we're made to experience certain flashbacks in the order they are presented. It all has to make sense somehow, right? There are slow burn TV shows and this is a bit of a slow burn book, primarily because of its disjoint narrative flow. But when things come together, they really come together and the end result is pretty heavy. The whole notion of being able to travel back and forth along one's timeline does push the notion that our lives are more or less fixed and there's nothing that we can do to change the course of our lives. And while that sort of feels like a defeated attitude to take, it's a sort of understandable perspective to take when it comes to a man having seen a massacre like Dresden. Beyond the aliens and the time travel, this book is really about Billy finding a way to come to terms with what he had experienced during the war. There's the added challenge that he actually has to re-live the events over and over again at random intervals because of his odd new ability. And that could be enough to break just about anyone, but still he manages to persevere and he gains new perspective on things given his traveling. Slaughterhouse Five isn't an easy book to read, but it's certainly a compelling and fulfilling one. I doubt that this review can be used to help anyone write any sort of school paper about this book, but I wouldn't be surprised if someone tries to do precisely that should they read this review all the way to the end. As for the book, it gets a good 4 "So it goes" out of a possible 5.